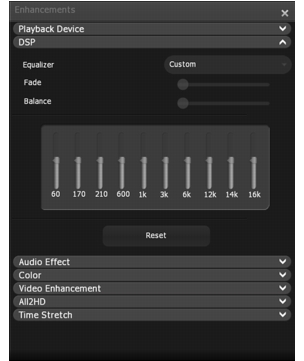 In DSP, enhance your audio playback by selecting preset equalizer settings based on various types of sound. Options include: Rock, Bass, Hall, Soft, Vocal, Classics, Blues, Pop, Rap, Metal, Country, Jazz, Folk, New Age, Opera, Swing, Speech and Custom. Choose Custom to manually adjust the equalizer. Adjust the sliders to specify which frequencies are increased or decreased in amplitude. Fade: Adjusts the amount of sound given to each speaker. Balance: Adjusts the balance between left and right. Reset: Returns settings to default.